Bar coding only works with Enterprise Solutions with an Advanced Inventory subscription. Bar coding is not available in QuickBooks Pro or QuickBooks Premier. Managing inventory can be a daunting task for a business with thousands of products in multiple locations. 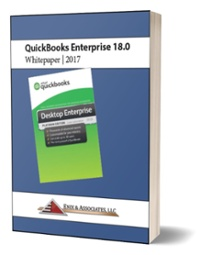 Good news for manufacturers and distributors - the latest version of QuickBooks Enterprise includes new Advanced Inventory features. Set up a G/L account called "Prepaid Inventory." The type of account should be "Bank." When the product is ordered enter a Purchase Order in QB Point of Sale. Inventory Assemblies are used for entering a bill of material to detail the components which are required to build a finished good or a sub-assembly.